WHAT WERE YOU DOING IN 2000? WHERE WERE YOU? HOW OLD WERE YOU? WHAT DO YOU REMEMBER? JOIN US ON A LITTLE TRIP DOWN MEMORY LANE TO 2000. • The last natural Pyrenean ibex is found dead, apparently killed by a falling tree. • Wall Street has to close early after a large crowd of people forms outside to watch rap-metal band Rage Against the Machine perform for free. • A high-level meeting of al-Qaida members (including two 9/11 American Airlines hijackers) takes place in Kuala Lumpur, Malaysia. Many believe this is where the plans for the 9/11 US attacks were laid. Great news! The latest issue of Hot English (191) is out now! Learn over 1,000 useful words and expressions and improve your listening skills with Learn Hot English! 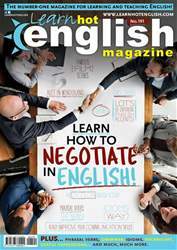 This month: How to negotiate in English. Find out how to respond to a proposal and get the best deal possible. Plus, 12 useful words and expressions for talking about drinks, 10 expressions for describing “stupid” people, 6 useful expressions for talking about the phone, idioms, phrasal verbs... plus: • The environment – edible plates. • Business – team building. • Speaking – making small talk. • Grammar – the present perfect with “since” and “for”. • Business skills – negotiation quotes. • Social English – the wedding. • Cinema – famous film scenes. • Literature – Alice in Wonderland. • Celebrities – Helena Bonham Carter. • Travel – Oxford. • Animals – whales. • Food – spaghetti recipe. • Accents – the Dutch English accent. • History – La Sagrada Familia. • Language – portmanteau. AND LOTS, LOTS MORE! By reading and listening to all this great content, you'll improve your English reading and listening skills and learn up to 1,000 useful words or expressions. Plus, you'll get a better job and pass English-language exams more easily. Guaranteed!